The Purchasing Managers’s Index (PMI) in the Czech Republic dropped to 54.9 points in August after 55.2 recorded in July. Although the August PMI print is the lowest in the past year, it still indicates solidly improving conditions in the manufacturing industry, albeit at a slower pace. According to Markit, the August PMI drop was due to weaker growth in production and new orders. Despite a lack of workers, companies have been able to partially fill vacant jobs. Inflationary pressures remain high, input price growth has been the second highest since the end of last year, mainly due to higher raw material prices, especially steel, as well as exchange rate developments. However, companies managed to partially pass the higher costs onto their clients. 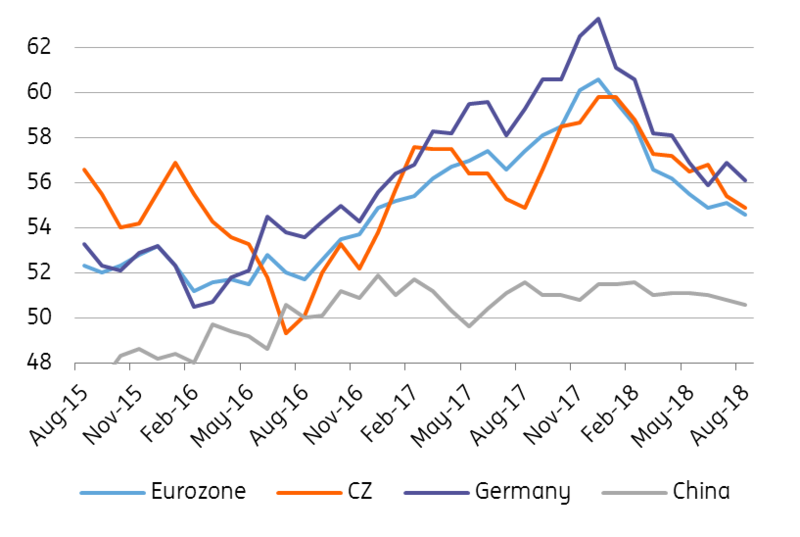 The Czech manufacturing PMI has slowed down in the past few moths but there are a number of reasons why we do not see this as overly negative. The manufacturing PMI in Germany somewhat improved in July, bringing slightly more optimistic prospects for the domestic industry as well. August's value is below the average of the last year, but is still solidly above the 50-point level, and still just slightly below the 4-year average. PMI values ​​may be more volatile during summer months due to one-off factors and company holidays. Lower PMIs are broadly consistent with the expectation that domestic industrial production, after 6.5% growth last year, will slow down towards 3% YoY this year. As such, a somewhat weaker PMI compared to the previous year should not be surprising.